René Magritte, though related to surrealism, his work stands alone, and differs from the bizarre images and landscapes of Salvador Dali and Max Ernst. Magritte does not draw out fantastic plots and characters from the depths of his subconscious, he writes ordinary objects in an absolutely absurd combination. The apparent simplicity of trivial things becomes deceptive in the paintings of the artist. The painting “Personal Values” is a depiction of typical everyday objects that may be different values of people. And they can be different among people: for someone it is entertainment or alcohol, for others it is beauty. Depicting these personal values, the artist grotesquely reflects their essence. Magritte in this picture reveals the problematic character of visual perception and the illusory image, using the symbols of a mirror, sky, and reflection. The sky background is the artist’s “card”. Although items are presented on an enlarged scale, the sky seems to be an infinite symbol of each person’s dream. The sky is often used image in the paintings of different artists, but the sky of Magritte is impossible to confuse. He transforms the image of the sky, subordinating it to his ideas. In his paintings, the sky is reflected in mirrors or huge eyes, fills the silhouettes of the images of birds, together with the horizon line from the landscape smoothly turns into an easel. In the painting “Personal Values,” the sky replaces the gray walls of the room. Judging by the name of the picture, the meaning in it is important for the artist himself. He shows the significance of each of them, using the technique of ancient Egyptian art – the more the object depicted, the more important it is. Thus, in the foreground, a huge glass symbolizing alcohol appears before the viewer. Next to soap, talking about cleanliness and a pencil used by the artist for sketching their ideas. 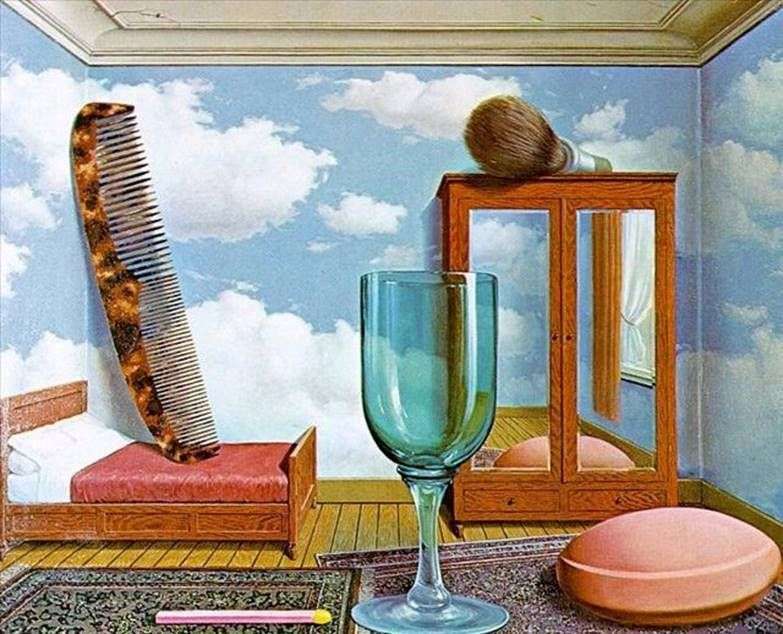 An exaggerated size comb and shaving brush indicate that the artist was keeping an eye on his appearance, but was not a mod because the cabinet in the painting is small. The bed is also not the main subject, because the artist worked a lot on his creations. Love for comfort highlighted by carpets on the floor. And the connecting link of the whole composition is the sky, enveloping everything around and soothing. In this picture, it symbolizes the painter’s desire for freedom, both in creative and in his soul. So, using simple things, Magritte conveyed in the picture important values in his life, through which the character of the artist himself is revealed. Description and meaning of the painting Personal Values by Rene Magritte.